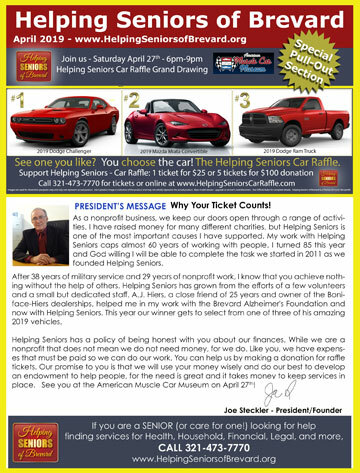 These are the Official Rules for the Helping Seniors of Brevard Inc. “Great Car Raffle” offer. Helping Seniors of Brevard is a registered Florida 501(c)(3) not-for-profit organization serving Seniors in Brevard County Florida through its Senior Information Helpline, its Senior Information Media Outreach, and its Senior Advocacy programs. By entering this drawing, all participants and winner(s) consent to the use of their names and likeness in publicity related to the drawing and its outcome without compensation and waives any and all claims against Helping Seniors of Brevard Inc. Participants of this drawing must be 18 years of age or older at the time of entry. Donations for tickets will begin on September 20, 2018, and will cease 30 minutes prior to the 6 p.m. drawing on April 27, 2019. General Conditions: By entering, entrants accept and agree to the Official Rules and the decisions of Helping Seniors of Brevard Inc. Suggested minimum donation of $25.00 dollars per entry. There is no minimum or maximum amount of tickets to be sold. Donations may be tax deductible and deductions may benefit donors differently. Tickets for this drawing will be issued on first come, first served basis. Checks and Money Orders should be made payable to Helping Seniors of Brevard Inc. and sent to: Helping Seniors of Brevard, P.O. Box 372936, Satellite Beach FL 32937. All monies must clear for ticket to be valid. Drawing will be held at 8:00 PM, April 27th, 2019, at the American Muscle Car Museum, 3500 Sarno Rd, Melbourne, FL 32934. Drawing is open to all ticket holders. Helping Seniors of Brevard Inc. reserves the right to award prize to those whom it determines the winner(s). All decisions are final. Winner(s) will be responsible for all taxes (Federal, State and Local) as well as licensing, registration, and delivery of prize. Winner(s) will be notified by telephone, e-mail, and or US Mail at the information indicated at time of ticket purchase. Winner must present purchase receipt and valid identification to claim prize. Prize must be claimed within 30 days. 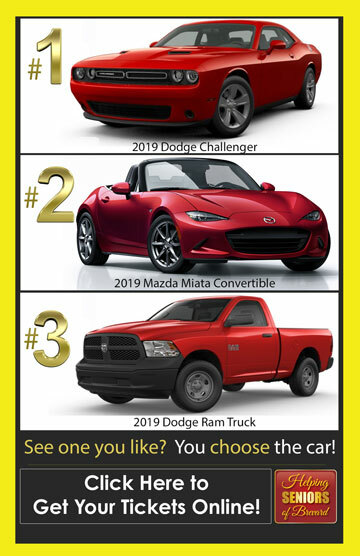 Any images that appear anywhere connected to the Car Raffle are used for illustrative purposes only and may not represent actual product. Each product image is indicative of the product and may not wholly represent the actual product. Any images shown are for base model, Any upgrades from base model are at winner’s cost and sole discretion. Helping Seniors of Brevard Inc. makes no warranty of any nature with respect to the raffle or the prize, whether in respect of fitness for a particular purpose, satisfactory quality or otherwise. Entrants acknowledge that, except as specifically set forth herein, Helping Seniors of Brevard Inc. has not made and disclaims all liability for any warranty, representation or guarantee, express or implied, in fact or in law, related to the raffle or the prize. Name of winner(s) or copy of Official Rules may be obtained by sending a self-addressed, postage paid envelope to Helping Seniors of Brevard, P.O. Box 372936, Satellite Beach FL 32937. Donations to Helping Seniors of Brevard and this event are non-refundable. Helping Seniors of Brevard IS REGISTERED WITH FLORIDA DEPARTMENT OF AGRICULTURE AND CONSUMER SERVICES. A COPY OF THE OFFICIAL REGISTRATION AND FINANCIAL INFORMATION MAY BE OBTAINED FROM THE DIVISION OF CONSUMER SERVICES BY CALLING 1-800-435-7352 WITHIN THE STATE. REGISTRATION DOES NOT IMPLY ENDORSEMENT, APPROVAL, OR RECOMMENDATION BY THE STATE. For additional information or confirmation of drawing date contact the Helping Seniors of Brevard or 321-473-7770 .